The neckline is a little sloppy hbut other than that it is great. Comfy and I really like the color. Update your wardrobe with this stylish draped dress. This dressfeatures dolman sleeves and elegant draped sides with a crewneck. This dress fits well. I wear a pair of leggings under it and I feel less concours. I liked it enough to order another in a different color. Love this dress. Material is great, size is true. I love this over size dress very comfortable. You can down play this dress or dress it up with heels nice. This draped dress is super cute! Love, love, this dress. True to size, very comfortable, easy to wash, and flattering fit. I receive compliments every time I wear this dress. Great buy! I am going to love wearing this dress. I look like I lost fifteen pounds. Adorable and well made. It is appropriate for all occasions. It feels very comfortable. I purchased this dress not really knowing if I would like it or not. However, I was pleasantly surprised at how well it fit, and it is the perfect "basic" color for really any occasion. You can dress it up with jewelry or wear it as a Saturday afternoon brunch outfit. Perfect when you want to look good but don’t want to go through a lot of changes. "Will this dress look okay on a size 2X woman with heavy breasts and back fat? I cannot seem to find a good bra to cover the fat and it's very embarrassing. Since I am a lot of medications for various illnesses, dieting does not help. Am considering liposuction in the Fall." 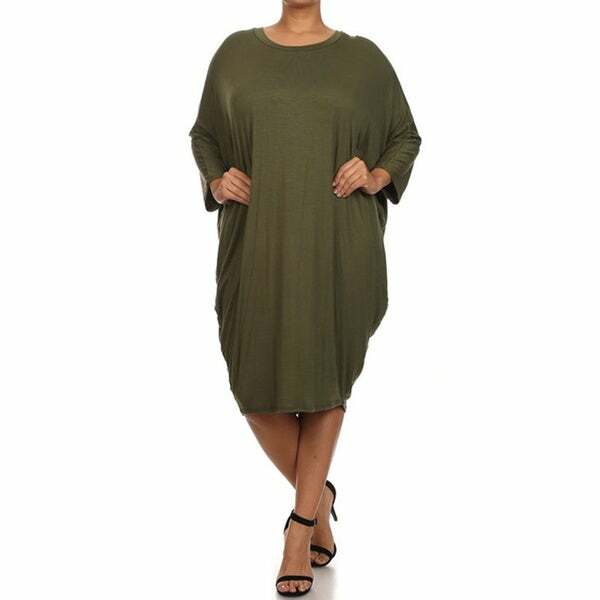 This is a loose fitting dress that appears to hang away from the body in the back and is designed to fit plus sized frames.